This deck primarily relies on its Ace—Download. By cheesing through Levels rapidly, it can arrive at Millenniumon and effectively stop most opposing strategies, as well as disrupt the speed of the opponent’s play. Using high-body Ultimates like Kimeramon, this deck has an easy time progressing through its evolution steps, with or without its many Evolution cards. It tries to pack an answer for every occasion, then uses Millenniumon’s ability (and DATA card) to refresh the deck of the best solutions for the current matchup. Over a short time, the deck becomes incredibly tooled to the specific opponent being faced. For high skill players, the deck also tends to have a lack of good prediction effects. Only Millenniumon and Airdramon have good To-Zero specials, with the former’s requiring a turn to set it up. Airdramon won’t be a body on the field for long, but that can hypothetically increase the usability of its To-Zero. Kimeramon has a Cross To-Zero but would rarely use it unless it’s time to evolve or the opponent can gain way too much advantage from a 1st Attack, x3 VS, or Drain ability. Outside of these mundane cases, Set EX Palmon exists in the deck which can give an attack-prediction for +400 Power. This can be absolutely crucial, but if not recycled, is highly limited. Due to the limited predictive power, it is an easier deck to play but also one with less maximum potential. Mostly weak to Wind x3 VS, but several additional weaknesses occasionally. Prioritize removing these particular cards in the pre-setup. Adjust to your matchup. This pre-setup removal will prioritize getting as much early-game as possible and minimizing late game. Most games, I will remove the Mutates and Silver Ball over the 3 Firewalls in the deck, just because Firewalls are technically more viable early game most of the time. Level crush is absolutely dead. Millenniumon DATA could be good but only if you lead with an early lot of trashing, which is rare. Vending Machine is even worse because it’s also slow. Credit for the original list goes to member SubZero. See visual list for specific card versions whenever ambiguous. 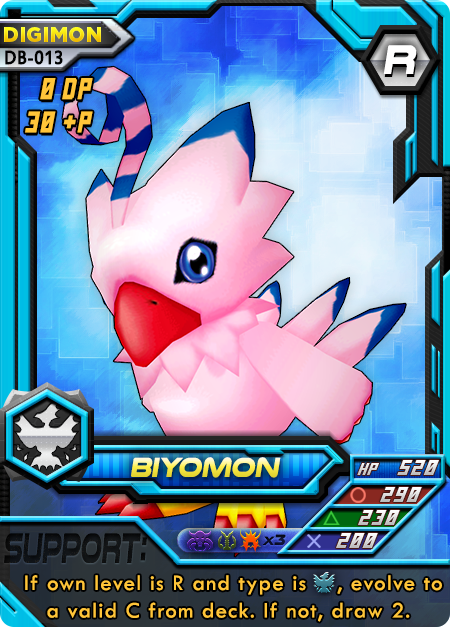 4 (DB) Biyomon – Used primarily for her draw 2, as the evolve effect is only usable early game. Evolve effect is great for not only fixing an early brick but also for toolboxing a specific Level C for the situation needed (Jamming on Aquilamon or Circle hate on Airdramon for example). This can also assist bluffing before attacks are chosen, especially since the other Rs don’t have Circle hate, therefore Airdramon is a great pick; and moves forward into Kimeramon’s DNA. 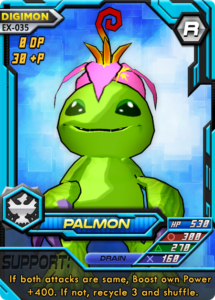 4 (EX) Palmon – The one and only good predictive card in the deck. Power +400 on the same-prediction is pretty top notch here and can easily end an annoying opposing Level C with too much health or a Level U that slipped in. The alternative helps fuel our main inevitability engine of recuperating the deck. 1 Lucemon – Having the ability to void anything is pretty nice, even though it lets the opponent draw. Even if this gets digimon-voided (but not Firewalled), you still get the type change effect, which can be crucial for activating Aquilamon to fetch the Ace or attaching Kokatorimon to start the engine. 1 Monodramon Partner – This is our partner. I sincerely wish we could use it to evolve or use the support regularly. 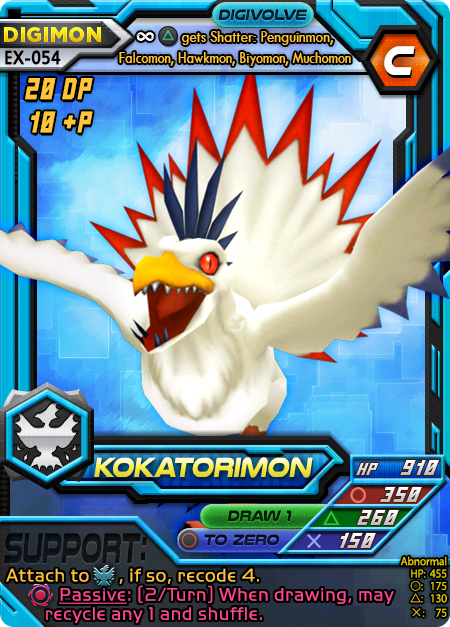 Unfortunately, until the DATA proxy is used, Monodramon must be considered nothing more than a searchable DATA card for the purposes of Mega evolving. After that, he facilitates our deck quite well. Just about any replacement partner would probably do well here. 4 Airdramon – Decent HP body for stalling until Level U if necessary. 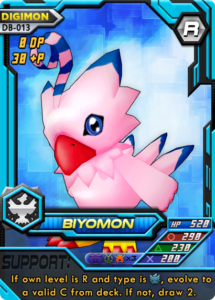 Can be devastating if it comes from Biyomon. Can occasionally search Aeroveedramon. Sadly, this support is often a dud and is only necessary for Kimeramon’s easy DNA. 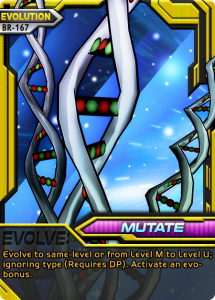 When on the active, any Metal (not in deck), Wind or Dragon can be used as DNA for Kimeramon. This essentially means any Level C in this deck. 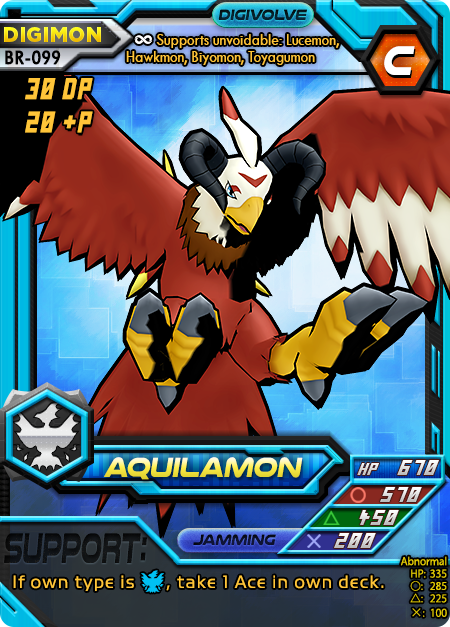 4 Aquilamon – Despite the ridiculous body on this bird—which is quite handy, the primary use for it is to support and fetch Download. 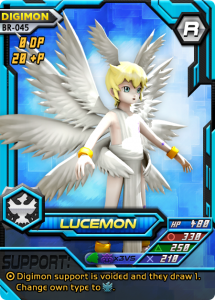 This can be difficult if Download was recycled after evolving to Kimeramon/Millenniumon since their types are Enigma, but their bodies should buy enough time to get a Puppet Switch or Lucemon. This card is absolutely crucial early, then used about once after that to return Download to the hand after it’s recycled and sits in the trash unused. 1 Kokatorimon – This card provides valuable engine-fuel by itself. As long as you don’t lose the active, it should start adding quality to the deck almost immediately. In the ideal game, Kokatorimon isn’t actually usable until a type change occurs, since you would be Downloaded to a Kimeramon. However, Aeroveedramon and Megadramon do exist as temporary surrogates with huge bodies, so the Kokatorimon is still possible on Level U. It cannot be overstated how crucial this attachment is to the function of the deck. If it gets shattered, it should be the top recycle priority for later use. This along with trash-cost cards in the deck can single-handedly set up the deck as a raging inferno. 1 Birdramon – The support can find the partner when KO’d, which is a bit of a setback but absolutely better than not having it. Otherwise, it’s a good functional any-recycle to help boost our deck before its ready. 4 Kimeramon – Necessary for the main strategy. Large body. Gets us to Millenniumon. Great for Mutate and Level Crush. 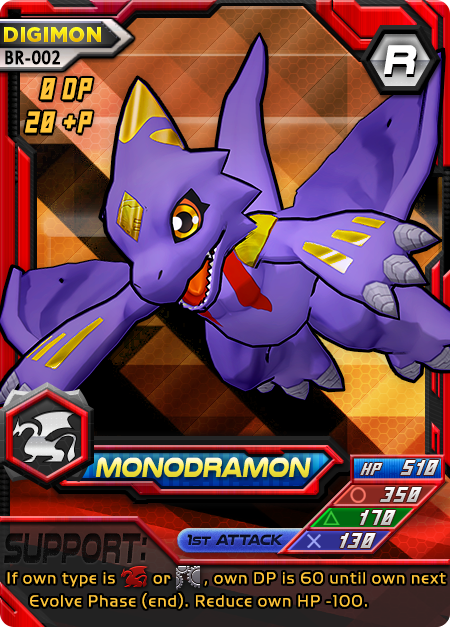 2 Megadramon – Primarily in the deck for its Wind typing (to activate supports) and level, Megadramon also boasts a pretty large body in the form of power. This can give us pseudo-Mega power until we’re ready to evolve. HP isn’t much of a concern in this deck when it can effectively bounce around high level Digimon repeatedly, so high Power is far more desirable. The support ability can be incredibly clutch as well, winning several games by KOing opposing Megas and Ultimates. 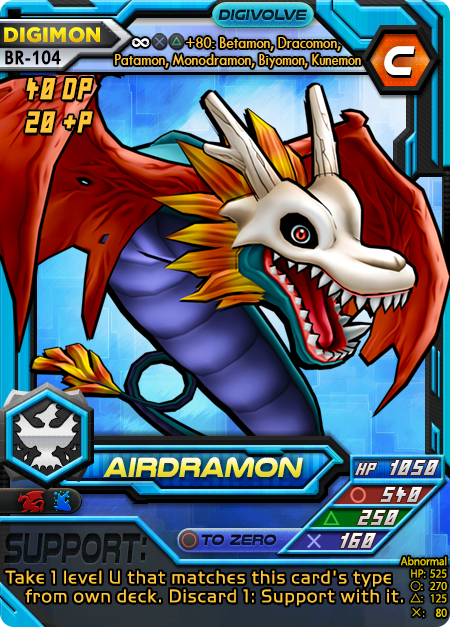 1 Aeroveedramon – This card has a lot going for it: If you normal evolve to it using Airdramon, it picks a card from the top 3. It has a decent body with a sometimes-necessary 1st Attack that’s pretty high. It can activate Wind-based supports and its own support is incredibly relevant almost all the time, doubling power on Level Us. Regardless, the fail state can give non-Us (such as Millenniumon) 1st Attack on support. 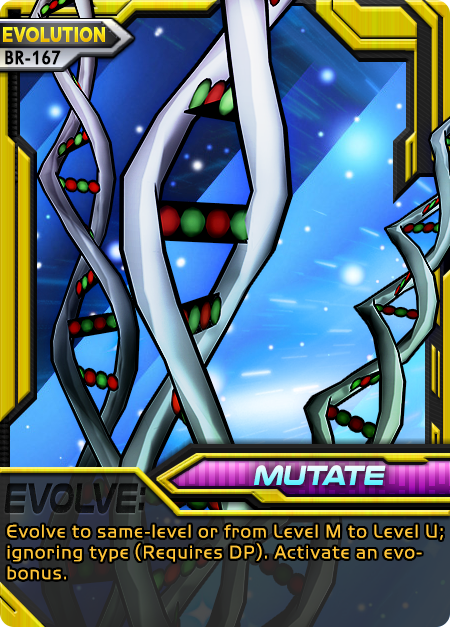 2 Mutate – Level-hop from U to U with 300 bonus HP. Ideally, the target is from Aeroveedramon/Megadramon to Kimeramon once the partner is drawn. However, Mutating to stay alive is perfectly valid as well. Make sure to rack the +30Ps in the deck so their costs can be paid. 1 Level Crush – Used almost exclusively to deny the 2KOs when Millenniumon starts to get weak. By the point, the deck should be perfectly set up and Level Crush has a high likelihood of being drawn from a trim and fit deck. Crush down to Kimeramon and start preparing the Download/Mutates for more endurance later. At this point, Kimeramon’s HP would be 4020, which is soul-crushing to face. 1 Download ACE – The bread and butter of the deck. Download should be used liberally, early, and often. Always attempt to recycle this into the deck and bank one in hand in case an HP-refresh is necessary. This card can potentially ensure an opponent never gets a KO. 1 Super Tag – This is a semi-fail state but can assist at getting to Level U without trouble. In addition, it sets up a nice DP contingency in case the main hitter dies unexpectedly. 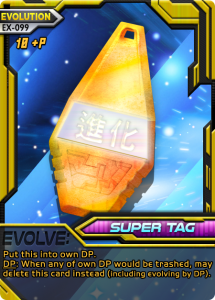 It’s possible to use Super Tag to set up for Mutate. 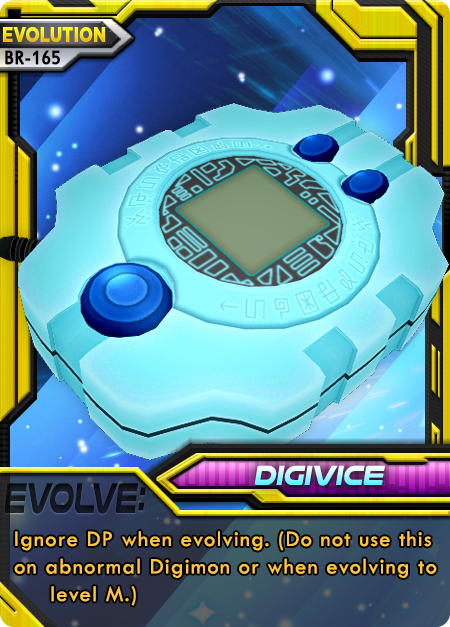 1 Digivice – Fail state but acts as an effective catch-all for Level U. 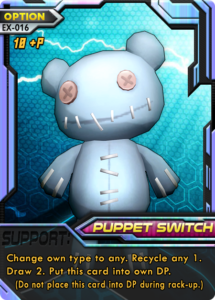 2 Puppet Switch – Essential for early re-use of Download and other key components of the deck (Millenniumon DATA). Use this to change to Wind type to enable supports. Keep hand size up. DP bonus helps set up Mutate. 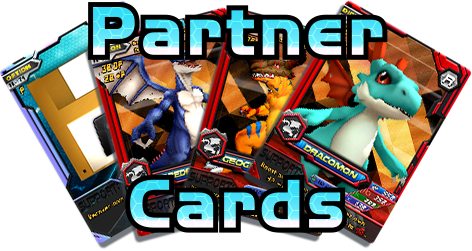 2 Partner Finder – The partner is incredibly key in this deck. 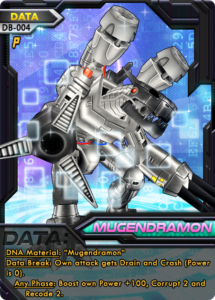 The road to Millenniumon is paved with Mugendramon DATA, and so it is our proxy card. The Partner must be in hand to use the proxy, so partner finders are more necessary than it may first seem. The good news is, after the first use, the second finder can be used to shuffle the partner back in, giving them a key appearance late game in case the main attacker gets KO’d with no good replacement. At 2, this deck essentially has 3 chances in the deck to get the partner. 2 Cherrymon’s Mist FIREWALL – This is the most orthodox and reliable Firewall. This could be at 3 copies, but homogeny kills in this deck. This deck requires diversity and re-use. 1 Dark Destroy FIREWALL – The third Firewall should be Dark Destroy. Since Death Evolution will always fail due to our higher level and Jugonsatsu simply adds more tankiness to an already tank deck, Dark Destroy is necessary. The ability to punish supporting with a Level U is devastating when the opponent is behind. 1 Vending Machine – No recycle-based deck would be complete without a Vending Machine. This makes the deck less vulnerable to trash, mulligans, and can help boost setup to the deck thinning process. 1 Training Manual – Necessary to plug a weakness to discard and since the deck needs to dig late game into the streamlined deck. 1 Mega Chip – The cost ironically sets up the deck by removing all cards at an equal rate, but the “recycle any” effects can cherry pick what goes back in. In addition, this makes a devastating blow. 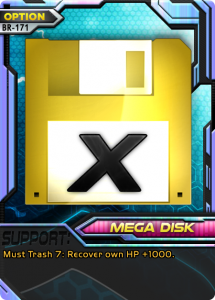 1 Mega Disk – Same as Mega Chip for purpose, but with slighly more trash capability and a significant increase to the deck’s endurance. This is often a target for constant re-use. 1 Silver Ball – Nearly staple leveler of playing fields. 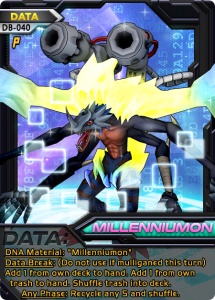 1 Millenniumon DATA – Almost always used as a slightly weaker Any-Phase Vending Machine, hence only one copy of vending machine. If any Data Break occurs, this deck will probably lose. Millenniumon – Main event. Use the Trash 3 cost to set up the trash incrementally. First time, it usually has to change its Cross in order to gain the best effect from the opponent. The most common is To-Zero, but you can always threaten a sudden 1st Attack kill out of nowhere. Bear in mind, this ability stays, it is not a lingering type that gets removed after the turn is over. That means if you choose Crash, be prepared to not only heal but change the Cross after. Always try to use the recycle any 2 if possible since it’s the primary engine of the deck, especially when compounded with Kokatorimon and several supports that do similar things. 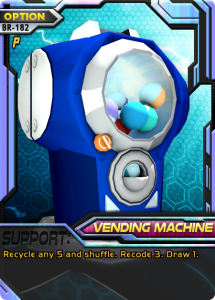 A one-turn setup can be achieved with a large enough trash, Kokatorimon, Millenniumon DATA any phase, and Vending Machine (recycles any 13 minimum, then sets up the top 3). This is similar to a heavy Recode deck except that it is a bit more flexible and can be faster. Airdramon – Just used as an emergency to Kimeramon. This will BRICK the Mugendramon DATA! (BR-059) Coredramon – This green guy has serious tank health in case of the horrifying problem where we partner evolve. Bricks Mugendramon DATA! Mugendramon DATA Proxy – If only we could use the Data Break or Any Phase without completely bricking the deck. However, the DNA material off of a heavily searchable partner means the deck has maximum consistency for getting to the main event. This card’s existence as the deck’s proxy could be a good argument for running no partner champions, and instead adding 2 cards to the main deck. 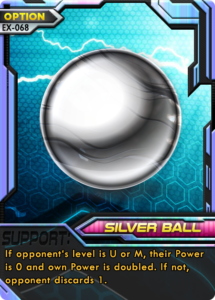 Super Tag – It’s a good card and has the before mentioned positives. 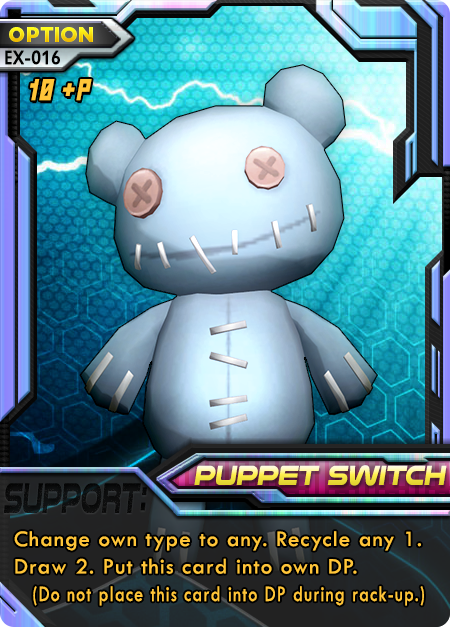 However, it’s more often than not a dead card due to requiring a Puppet Switch from a previous turn for the +10P it provides to be worthwhile. It’s almost better to use Meatvolution for the same purpose. Megadramon + Aeroveedramon – They’re good obviously. However, they don’t make much sense either. Just about any Level U would be possible here as long as it has Wind. MagnaAngemon could be better just for toolboxing type-hate from the deck. So could Angewomon or Garudamon. The list will only grow as the game gets older. 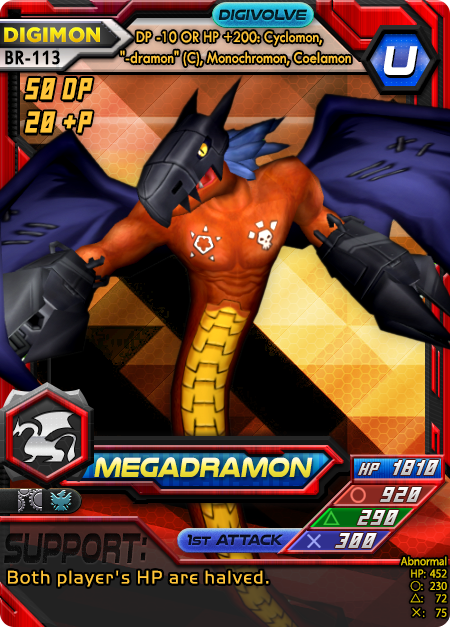 In fact, Aeroveedramon may be completely flawed and Megadramon may be the preferred U. Or none of these types at all, and you could just chance that you won’t need a specific type and try picking something monsterous from another type. 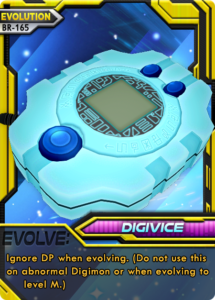 Maybe that causes D-Link to look like a better choice than Digivice or Super Tag. 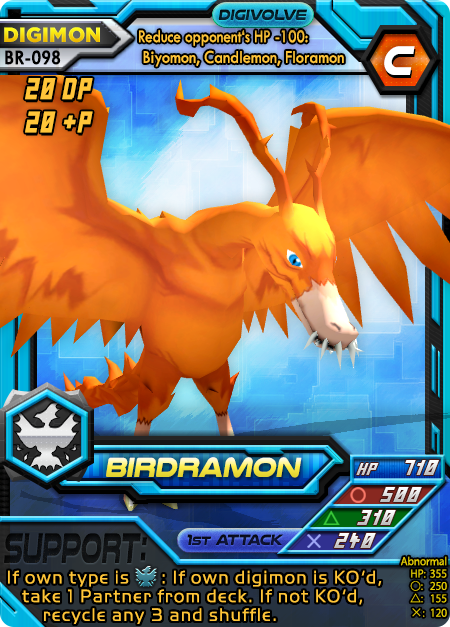 Birdramon – Probably the weakest champion choice in the deck. Howabout Kiwimon for some 1st Attack? Maybe we could run something that increases our Wind-type change consistency. Monodramon – Almost completely arbitrary. 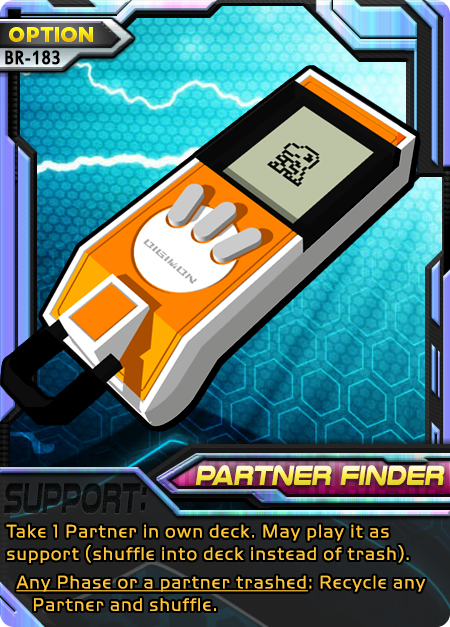 This deck could run just about any partner Digimon since the support and evolutions can never be used until after it’s proxied for a DATA. The possibilities here are endless. Only chosen because it feels weird not to have an extra Airdramon or 60 DP as a support. The entire Wind typing – Most unusually, the entire deck may be a flawed concept. Wind is certainly a good choice and proved itself in testing thus far. However, a better version of the deck might fail forward by running Monochromon and Cyclomon, to pick Download from the deck on a successful evobox. Admittedly, Kokatorimon carries Wind in this instance, and is the primary reason I stuck with SubZero’s original type choice. DATA as a proxy – It’s also possible that a better version of the deck might ditch having the DATA as a proxy and searching the partner and just hard-mulligan to the DATA in the main deck and then recovering the trash with oodles of recycle. Incredibly fast. 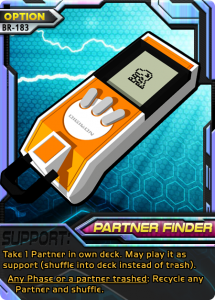 Download, Digivice, Super Tag, and several +30P Digimon make this deck a monster of speed. Skips levels regularly. High endurance. Usually, speed decks lack endurance because they skip crucial stepping stones like Champion Digimon, removing hit-absorption before healing through evolution. This deck uses Download and Mutate to repeatedly skip around level Ultimate, healing constantly. In addition, it Level Crushes from Mega to Ultimate for the same effect. Immense endurance. High Power. Speed decks tend to lack consistent matchup power as opponent catch up to their level. However, this deck abuses high-body Digimon and doesn’t suffer low power here. Inevitability engine. Millenniumon plus his DATA and other picky recycles (Birdramon) allow this deck to continuously weed out the unnecessary cards through the course of the game. Bricking becomes non-existent by late game. Early game can brick. Due to high reliance on Evolution cards to set up, your early game is incredibly vulnerable to well-placed Death Evolutions and simple miss-hands. Mitigate with a liberal opening game mulligan and have a backup plan to evolve orthodox. Vulnerable if it has to mulligan too much. Some decks can bounce back and typically one with this much recycle can, but it tends not to be enough. In fact, the deck tries to actively put bulk in the trash. Surprisingly vulnerable to a trash-oriented deck. Control decks make this a tough matchup. You don’t have much to recover hand size other than set DB Biyomons and single cards. If someone can effectively keep your hand low and fog the game long enough, there’s not many tricks in this deck to overcome that. Circle punishment is devastating. This is a deck that is overly-reliant on Circle until it gets Millenniumon, where it can ride Cross to victory. Lower-level cards are devastating. Data Hijack, Black Gear, Whistle, and the list goes on… low-level cards can grind this deck to a screeching halt, allowing the opponent ample time to catch up. This effectively nullifies all of the speed the deck has built to that point. It would then need to solely rely upon endurance and its inevitability engine. Behind the gears of “Time Stop” lurks a beast ready to awaken. This is a deck that thoroughly abuses time asymmetry—wherein earlier plays tend to compound their effects on the game; not only through insanely fast evolution, but also by streamlining the deck of unnecessary cards based on the opponent. Given this, it’s difficult to soft-counter this deck, much more to hard-counter it. Absolutely top play is necessary from the opponent in order to not get run over immediately. 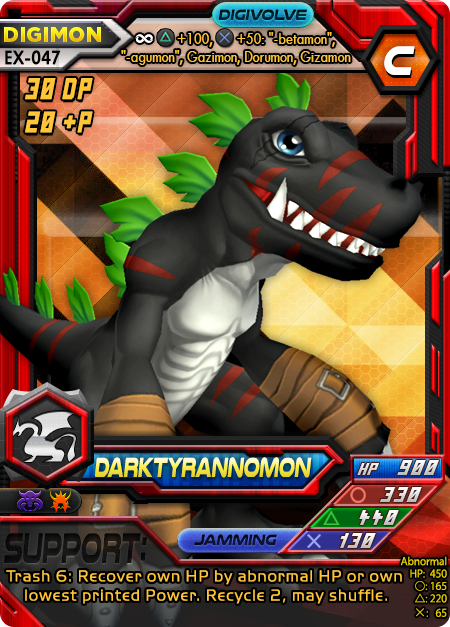 If Digimon Battle Evolution had tournaments, this is the style of deck I would expect to see at top levels of play. It gets checked hard against Rookie-counter, low-level Crash, and rush decks that pack Circle-hate, but it plays the long game while also setting up totally insurmountable Digimon early. In this respect, it might be comparable to Magic‘s “Tron” deck type in modern. If you’re the type of player that likes to get in early, have a ton of contingency plans, and set up for the long winter, give Time Stop a go! Credit again, for the original deck list should go to member SubZero. Mostly with respect to the bold idea to have the DATA as the proxy, repeatedly abuse Download, and use a Wind core for consistency. This version of the deck has been adapted to the deck list legality changes that allow more cards (50 shared between the DZ and main deck, adding +6 cards to the deck) and to further refine its main strategy. 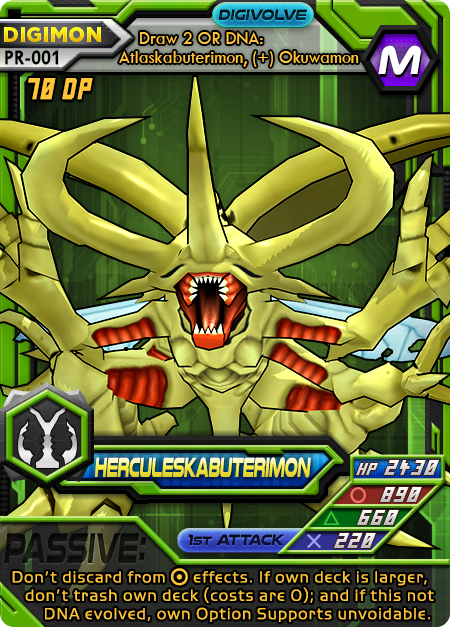 Along with some emergency-erratas taking place after the launch of Data Breakers, we’re bringing two new Promo cards that will be legal for play and available on both Tabletop Simulator and OCTGN: Dukemon and Herculeskabuterimon. Originally, these cards were slated for a much later set release that would likely come out at the end of the year. Instead, we’re moving them up since they’re fully ready for play and to apologize for the mini-errata coming soon, as well as the lack of COTDs. Those COTDs did have to be put on hold temporarily however, since much of our attention has been diverted attempting to convert Alsciende’s NetrunnerDB into a DigimonDB, as well as other side-projects. For now, we’re shelving it since it’s eating up too much time and should return to COTDs and design shortly. Without further ado, here are the new cards! These aren’t being released as part of a specific set. Instead, they are numbered for the “PR” or “Promo” pool of cards. We’ve had promotional cards before, but they were always previews of upcoming sets. This time, we’re starting a promo pool so cards can be released in-between sets, especially ones that would be nice to have in the game but won’t fit within the parameters of the next set. Plug-In Backup—Keep your deck big and quality while evolving. What’s good about it: Since you often have to use Rookies for Rack-Up, this returns them back to the deck, which is necessary for keeping up throughout late game. Since you get to choose everything that goes back in, it’s very quality and can increase the long-term draw quality. This respects “Super Tag”, allowing you to simply Recycle any 2, making your next 2 draws/supports anything from your trash. What’s bad about it: Way early game, you usually don’t have the recycle live. Requires evolving by DP, though that should be the norm for shuffling in your DP. Doesn’t shine in decks that can 1-Rack evolve. It can be small potatoes even if you plan for it properly. 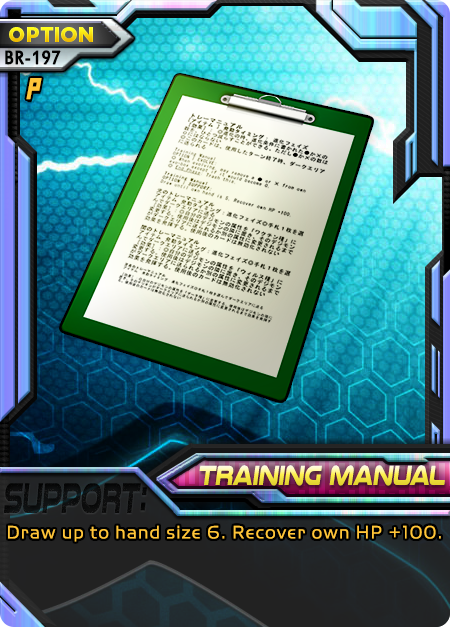 Tips: Make sure you’re not trying to use lots of external DP-gain effects such as Monodramon, Raremon, or evo-box bonuses for this. If you do, you’ll lose out on a lot of its potency. This is similar to a Vending Machine that you use during evolution, but that combos better with Super Tag allowing you to do remarkable setups where you re-use key cards like Firewalls and Aces immediately after evolution. This is best used early-mid, or midgame when your trash has the highest potential for abuse OR after deliberately hard-mulling your hands a few times to search your Ace, use it, evolve with this, then re-use the ace. This can also work well without Super Tag, since you’ll be getting that Ace/Firewall later in the game too. If you find yourself running out of quality Rack-Up later in the game, causing a loss (common problem), try Plug-In Backup. DB-014 Hagurumon—A Rookie fit to assist Crash. What’s good about it: Immediately, you’re drawn to the Support ability which attaches and saves you from the perils of Crash. 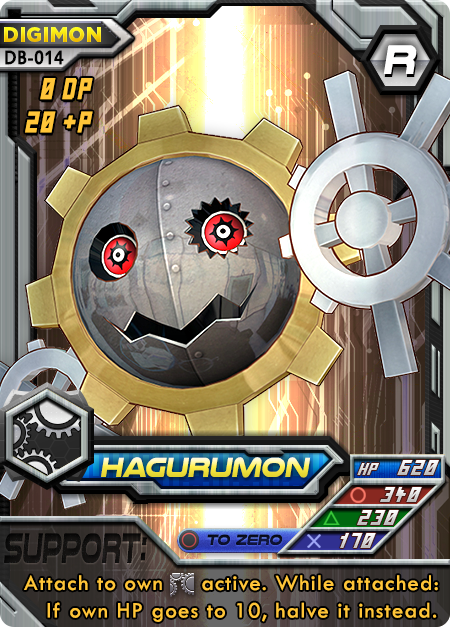 Since —the type Hagurumon most easily assists, has a staggering amount of Crash, it fits right in. Circle to zero helps tremendously to keep it alive on a medium-strength body. One of the rare attachments where you will be able to use the ability the turn it attaches, so you don’t waste a turn. What’s bad about it: You shouldn’t hang out on this Active (it’s not Goblimon after all). You’re still going to lose HP, diminishing the possibilities of this card far more than it may first appear. Takes away the slot of the valuable “Miracles Crest” which lets you use your own Active’s Support (something crash-centric decks already strive for). Tips: Well now you don’t have to run Concert Crash anymore. Pair this with other possibilities such as Chainsaw, Data Copy (for an instant kill with almost no downside), Waspmon, or add Drain when you Crash with cards like Dark Wings. Try changing your type to after attaching, so you unlock access to more Drain. Or change to to unlock access to powerful HP-based conditionals like Icemon. DB-013 Biyomon—An evolution-primed Rookie with serious hate. What’s good about it: The amazing ability to toolbox a Champion for direct, immediate evolution from the deck, which ignores DP since it’s outside the evolution phase. That ridiculous triple hate of with a high 200 base power for it (this is good even for many Champions with x3 VS). +30 P is always welcome on a Rookie, especially in Wind. If you don’t manage to be R and Wind for the Support, you still get a serviceable draw 2. What’s bad about it: Incredibly weak attacks otherwise. You need a serious back-up plan for this Digimon, if it gets stuck out there and left hanging with all those low-Power attacks and the extremely vulnerable HP. You will have to actually validate the Champion, which is locked to Wind Rookies. The x3 VS is only useful if you can actually hit with it without dying at Rookie level. You have to skip using an Evolution card that turn, which can stop you from getting pretty powerful bonuses. Tips: There are really not a lot of downsides to this card other than the loss of tempo. The Support isn’t just good for saving DP and toolboxing, it can also set an opponent up for failure if they think they’re going to KO a Rookie but nope, actually you pulled out a Champion (especially if it has a new attack ability that predicts what they planned for!). Make sure you aren’t playing this when you could just evolve normally to a good option in hand. Alternatively, the effect is also sort-of like “Super Tag” in that you’ll get to keep DP, so you can Rack-Up, skip evolving, use this as support to set up your Champion (be sure to know what attack you want to use during the Strategy Phase) and then you’ll be set DP-wise for Ultimate. 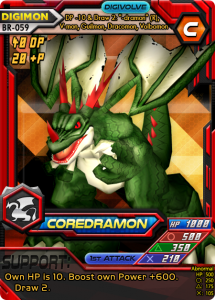 is really good x3 VS, especially if you manage to mix her into a deck with something like Sabirdramon. That unlocks the ability to abuse the x3 VS on a much larger scale, or even make a skeleton for a “Mastemon” deck. 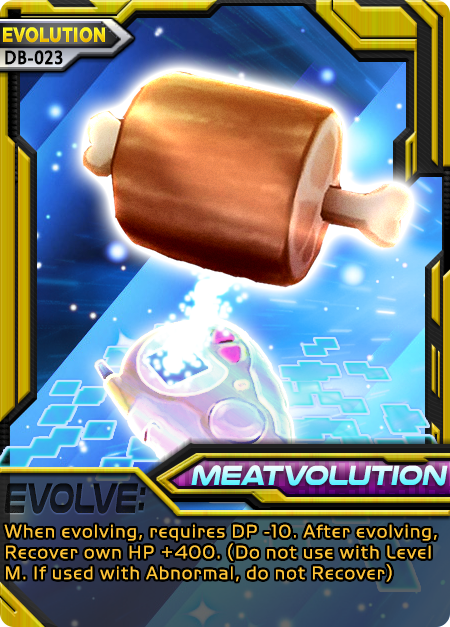 Meatvolution—A silly name but a serious healing card that recovers 300 HP when evolving. What’s good about it: There’s nothing more to say than free meat! 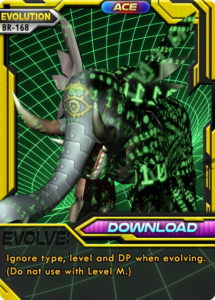 HP +300 (nearly unvoidable) outside of the Support Phase is pretty ridiculous, and like most utility-evolutions, Meatvolution sets your new Digimon up for success early. 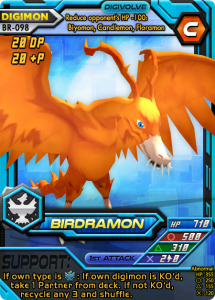 In this case, you get to use that shiny new Digimon for a much longer time before being forced to evolve again. It’s as powerful as Recovery Disk, which is often played in HP Recovery decks. 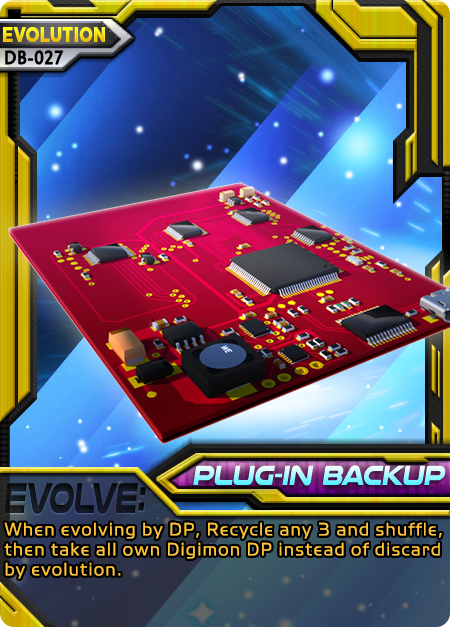 What’s bad about it: As typical with utility evolutions, you’ll have to evolve from DP and have your evolution taken care of independently of the card. This is just a bonus you get for doing things the old-fashioned way. It also still costs you a card from hand (and all your DP) so watch your card advantage. If you don’t actually need the extra 300 HP, this card can be a misplay or dead in hand. Tips: Make sure whatever you’re going to with this card can use the 300 extra HP. It’s especially good when you can search Meatvolution card situationally from your deck. 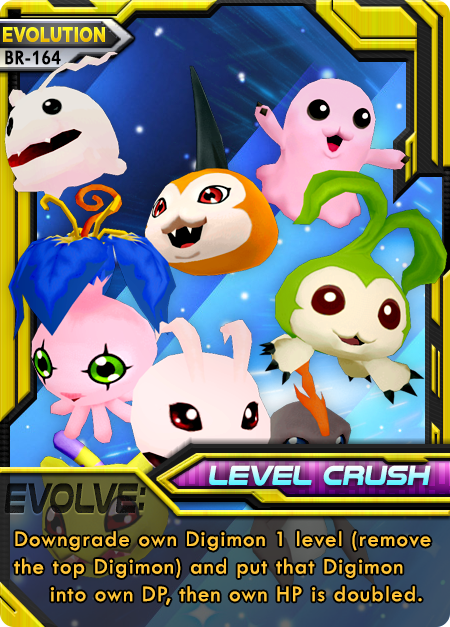 Almost always, “Level Crush” will provide you with far more HP; so always ask yourself if you are heavily gunning for an HP-based strategy or just want to shore up some weaknesses in your existing Digimon. Overall, it’s not a bad pick once you have your DP/evolution squared away. 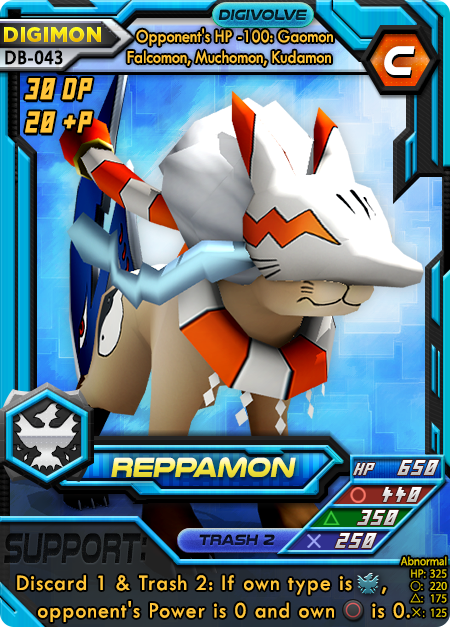 Reppamon—A Champion with heavy emphasis on support. What’s good about it: The evo-box damaging ability is always welcome, as -100 HP to the opponent could result in a pre-Batttle Phase KO. You can choose to pay the Support cost or not, which makes this at the very least not bad to top-deck. Reducing the opponent’s Power to zero, especially while you get to attack, is incredibly powerful and usually better than a “Counter” if implemented correctly. The “Trash 2” Cross-ability can be used to much effectiveness when paired with other Trash abilities, making your fast -based deck capable of reducing the max number of KOs necessary to win in short order. Its evo-box branches 3 different types. What’s bad about it: Its overall body is incredibly weak. You will be needing that evo-box bonus damage to deliver anything remotely resembling a KO, especially un-boosted. The +20P is a bit coarse in a type that tries to evolve as fast as possible. Lack of native 1st Attack on a weak body means it has trouble getting the final blow. Support is type-locked and attack-locked, on top of requiring a loss of card advantage (remember, you already -1 when you support with it). Tips: If you plan to use the support often, try using -locked effects that swap your with Power (e.g. “Love Crest), or use Digimon with higher Triangles, or Triangle-abilities (e.g. “Kiwimon”) for maximum effectiveness. 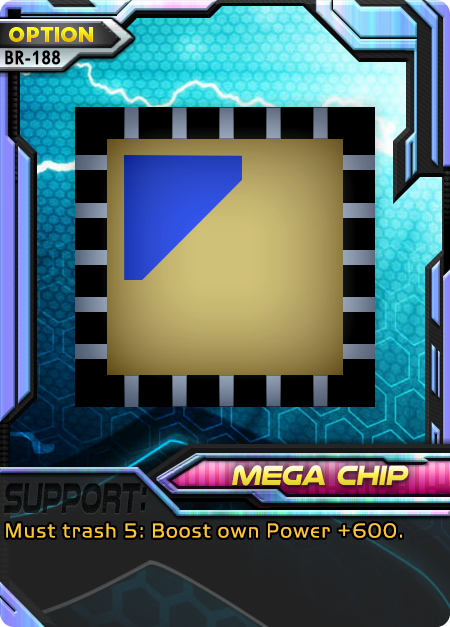 If you want to go for a trash-based strategy in Wind, make sure you protect its Cross and keep its HP up heavily with cards like “Large Disk”. Always set up the ability to evolve it to Level U ahead of time so you don’t get stuck on Reppamon and eat a KO. Okay, I admit, almost none of you actually asked this question to yourselves. Maybe a few who played the game Digimon Battles was based on: Digimon World: Digital Card Battles for Playstation. In that game, all the Mega Digimon were Level U (Ultimate). 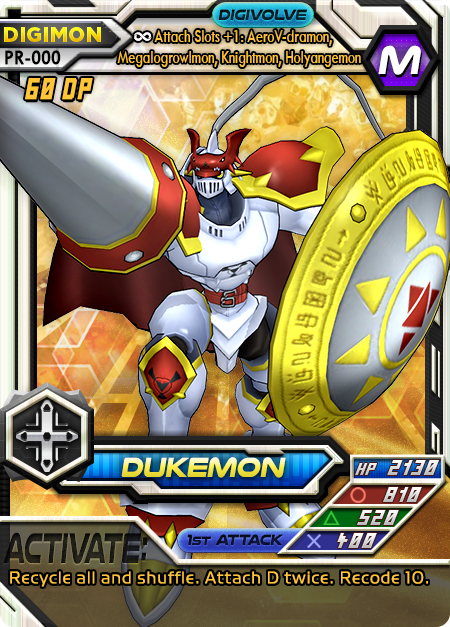 It may have even shocked some of you to see Digimon like HerculeseKabuterimon, Phoenixmon, and Wargreymon labeled as “U”! Why might that be? New set released! Let’s dive right in. What does this set contain? Links here will take you straight to an explanation of each new thing in the set! Sniper Disk—Evolution that lets you “snipe” cards right out of the opponent’s deck. What’s good about it: You get to see your opponent’s entire deck and every card that remains. This can target an Ace! It can also target Firewalls. You can hit an opponent’s Partner or Level Us to stop their plans early. If you hate being “sacked” by lucky late game draws, this fixes that problem immediately. Opponent can’t simply mulligan-spam into their best cards. You still get +10DP as long as your level is lower than the opponent’s. What’s bad about it: You have to actually evolve by DP. Gaining the +10DP bonus means you’re not using this card to stay ahead, you’re using it for damage control. Opponents can actively/passively resist this card with simple Recycle abilities, many of which are abundant and incidental. Significantly less effective later in the game and/or after Partner/Ace/Firewall cards have been played. 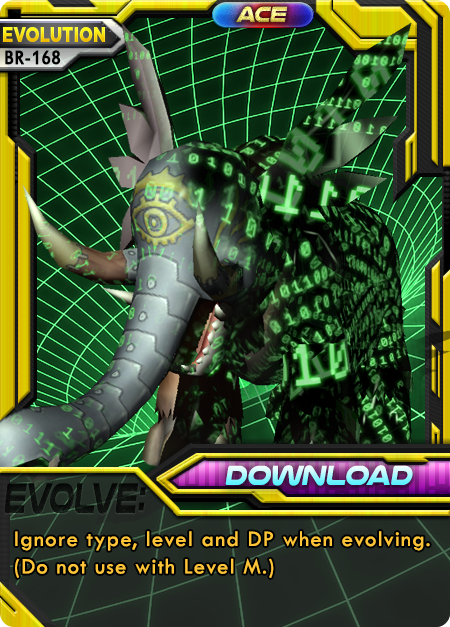 Need to have a legitimate evolution strategy independent of this card—it’s not “Digivice” after all. Tips: This one speaks for itself. 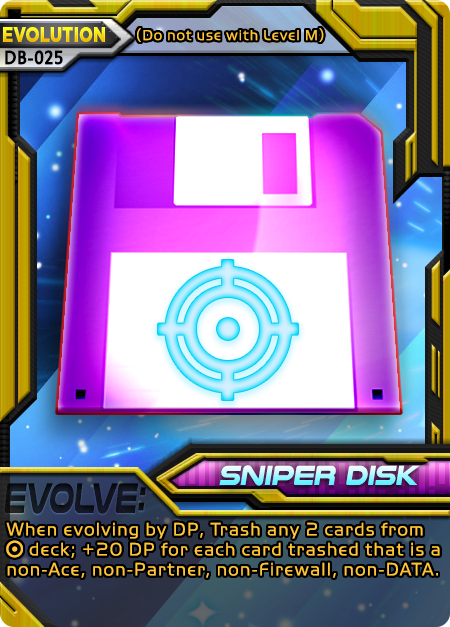 Make sure you have a good evolution structure to your deck independently of Sniper Disk. Always try to memorize the remaining cards in your opponent’s deck (you only get one shot). Snipe cards as mentioned above, which are Aces/Firewalls/Partners and other cards that may be problematic for you to deal with, or give the opponent fast or immediate upcoming advantage, especially if they do something reckless like spam mulligans. 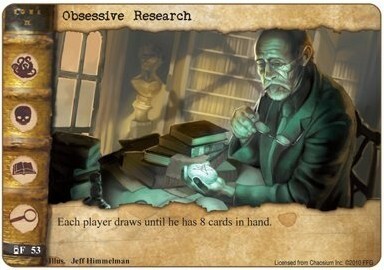 Try to use Evolution searchers to get this card when you need it, before all the good stuff gets played. Thus the Firewall keyword was born. It’s similar to how Ace cards work: You can have 3 of any firewalls in your deck, period. Essentially what this means is you can still run 3 Cherrymon’s Mist, but then you might miss out on other effects like the aforementioned Death Evolution. You could run 1 Mist and 2 Death Evolution. Or mix and match between the 3 new firewalls in Data Breakers and the original Mist in Base Release. Each one might fundamentally void effects, but all are pretty powerful (almost Ace-worthy, almost). It will definitely be a priority for us to make more Firewall-keyworded cards, so that players have plenty of strategy, can express themselves through their cards, and you know…don’t show up to a cocktail party in the same dress!